Marco Rubio has called on members of the State Department to provide additional funding to held the persecuted Christians abroad and to apply sanctions on governments that oppress the religious minorities. Reports have suggested that the U.S. State Department is about to designate the terror by the Islamic State against the Yazidis as being genocide, which it is clear, buy they may not do the same for Christians communities that are equally embattled. The U.S. Senator said that is only one part of the refusal of coming to grips with the complete weight of the facts. Rubio wrote about the plight of the Christians in an op-ed article co-authored by Russell Moore in the Washington Post Christmas Eve edition. The two wrote that the world has watched in horror over the past few years as the ISIS along with other groups that are jihadist have led to a ruthless, religious cleansing campaign. The two added that the tactics are bombing churches or converting them into mosques, violently driving Christians along with other minorities from their own homes, forcing people to convert to Islam or requiring compliance to an Islamic blasphemy and apostasy codes. Rubio and co-author Moore said the concerns they have go beyond those of just Christians, but also include other people of faith who are persecuted. Rubio was one of a number of senators recently introducing legislation that would reauthorize the U.S. Commission for International Religious Freedom, a body that is independent, monitors religious freedoms around the world, and makes recommendations to Congress and the President. President Obama also has spoken out over the persecuted Christians though not referencing specifically the funding from the State Department. In a prepared statement earlier in the week, Obama said he had been praying for the Christians that are being persecuted this holiday by ISIS. 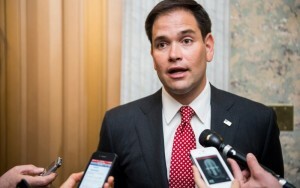 Rivals of Rubio for the president nomination of the Republicans have targeted this issue as well. Dimensional Fund Advisors LP Acquires 102,063 Shares of Monmouth R.E. Inv. Corp.